The Story of Ferdinand is one of my personal favorites. It is the book I read to my students every year, just because. It tells the story of a young bull who likes to sit under a cork tree quietly smelling the flowers. I like Ferdinand because I see him as an introvert and I can relate to his desire to sit in quiet peacefulness and smell flowers. I like his story because it is all about knowing who you are and accepting yourself. All of the other bulls wanted to be in the bull fights, but Ferdinand didn't. He knew that, but a bee sting confused the situation for everyone else. I like that Ferdinand never doubts himself. He does what he likes to do even when the picadores and the matador and the cheering crowd, and pretty much everyone else wants him to be different, ferocious. He isn't ferocious and he doesn't try to be. 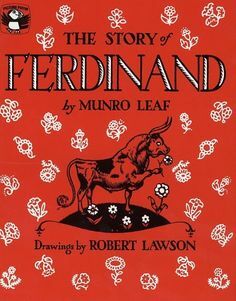 Like all great picture books, The Story of Ferdinand presents and important lesson about character without being preachy. It simply tells a story in which readers can see a reflection of themselves, or some aspect of themselves. It is isn't a new book, but it is definitely one worth sharing.